When the recently passed away watch designing legend Gerald Génta (more on his work here) was working on the octagonal shaped Royal Oak, he designed a sports watch with only basic functionality. Hours, minutes and a date window. Nothing more, nothing less. Using one of the most beautiful mechanical automatic movements developed by Jaeger-LeCoultre (caliber 2120), Audemars Piguet was able to keep Genta’s timepiece as flat as it was meant to be. Since then, a lot of variations of the original Royal Oak (patent can be found here) have been designed by Audemars Piguet. Purists might tell you that the only way to go is Jumbo, however, we tell you that there are other Royal Oak models that are just as interesting – or perhaps even more – to go after. 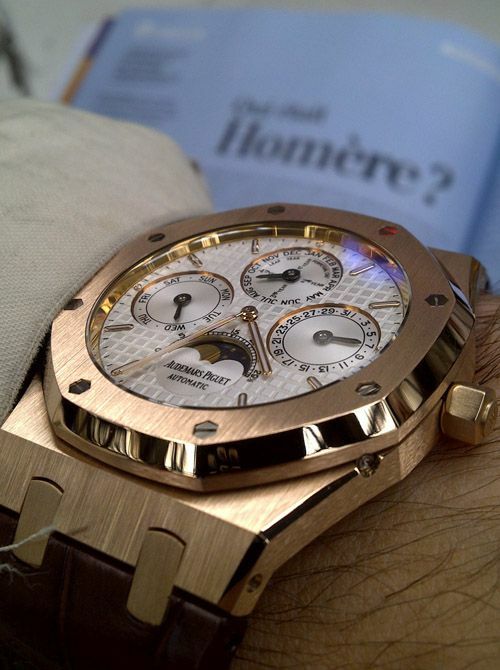 Timezone member Glenn2004 from Toulouse (France), showed his gold Audemars Piguet Royal Oak Quantieme Perpetuel (or Perpetual Calendar) on a brown leather alligator strap. As you can see, a wonderful combination of precious metals, mechanical complication and the octagonal sporty shape of the Royal Oak. This 39mm Royal Oak ref. 26252OR has the same diameter as the Jumbo and Royal Oak Date (15300) and makes it suitable for almost every wrist size. A very modest diameter for a watch with these type of complications, especially in the days that bigger still seems to be better. 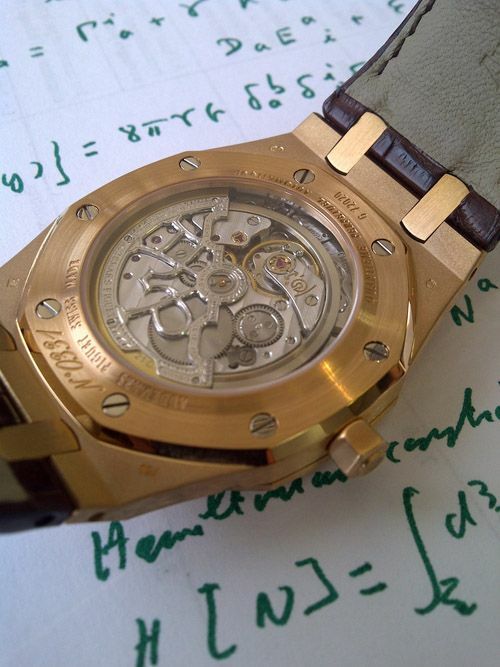 Under the hood, Audemars Piguet used their caliber 2120/2802. A movement based on the original caliber 2120 – based on Jaeger-LeCoultre’s caliber 920 – with a QP module added to it. Normally, the base movement is only 2.45mm in height, the QP module makes it 4mm in total. This excludes the 21 carat gold rotor, which is about half a millimeter in height. On top of the basic time, the Perpetual Calendar has day, date, moon phase, month and leap years functionality. Although the general love seems to go to the Offshore models these days, I think it are the beauties like these that make Audemars Piguet being mentioned in the same sentence as Vacheron Constantin and Patek Philippe. This piece of art retails for $83,900.- USD but is known to depreciate quite a bit over time. If you are fortunate enough, it might be a wise idea to check auctions or the Chrono24 website for a (relatively) good deal.